Nevertheless, a dog will probably pick off many of the cat fleas it hosts. 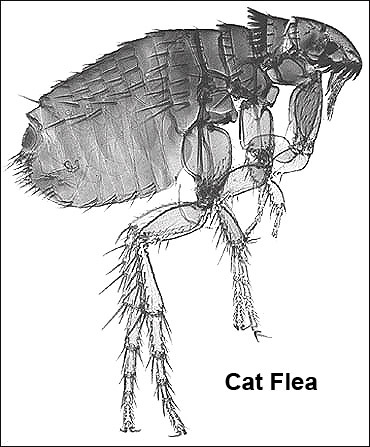 Cat fleas (Ctenocephalides felis) are more common on cats, dogs and humans than dog fleas (Ctenocephalides canis) and human fleas (Pulex irritans). Each has its preferred hosts. The human flea prefers the blood of humans and pigs. Cat and dog fleas prefer cats and dogs, though children can become infested when pets sleep or rest on the same bed. Cat and dog fleas also will infest certain types of wild carnivores, including opossums and raccoons, but not squirrels, rats or mice. While these two species do not carry human diseases, they can carry tapeworms (Dipylidium caninum) that infect dogs. Other flea species occasionally encountered by humans include the oriental rat flea (Xenopsylla cheopis) and the northern rat flea (Nosopsyllus fasciatus). These fleas live on Norway rats and roof rats, and are capable of transmitting plague and murine typhus to humans.